The Thunder King is set to be the biggest content patch for World of Warcraft since Mists of Pandaria launched last September. In preparation for the impending release of Patch 5.2: The Thunder King, Blizzard is having a sale on its official store, where you can pick up World Of Warcraft and its expansions on the cheap. The World Of Warcraft Battle Chest, which includes World of Warcraft along with the The Burning Crusade and Wrath of the Lich King expansion packs, is just a paltry $5. 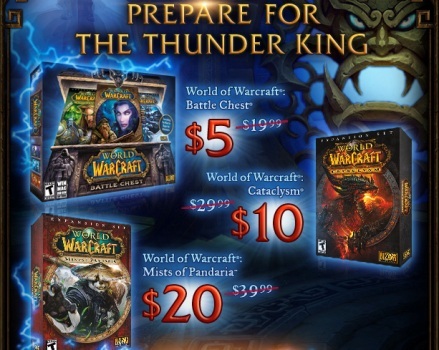 Cataclysm will set you back $10 and Mists of Pandaria has been reduced to $20. Both the physical and digital editions of all these games are on sale. Blizzard has not indicated when the sale will end, but we can assume that it will probably coincide with the release of patch 5.2. Patch 5.2 has many new features, but its centerpiece is the Thunder King daily quest hub and raid zone. The Isle of Thunder, the daily quest hub, features zones that will progressively be unlocked as players on individual realms contribute to the war effort, much akin to patch 4.2's Molten Front. Players can earn reputation with two new factions by performing either PvP or PvE based quests. Throne of Thunder is the first new raid zone since Mists of Pandaria's release and will feature 12 standard bosses and one special heroic mode only boss. Also included in the patch are two new world bosses, a continuation of Wrathion's legendary quest line, and improvements to the Sunsong ranch farming mini-game, one of the most well-received new features of the expansion. Players will be able to buy the ranch off Farmer Yoon, allowing them to use it as a rest point and receive work orders from other NPCs. There's a lengthy list of changes for each of the game's 11 classes, but the Monk and the Warlock have some of the most significant additions. Monks will receive several new abilities and talents, while Warlocks will finally be able to undergo a quest to permanently change the color of their fire spells from yellow to green. That's right, green fire is finally here! You can read the full list of patch notes here. There is currently no official release date for the patch, but estimates put it in the last week of February.